River City Blackhawk: Crushes & Carnage- Roller Derby Is Back!! 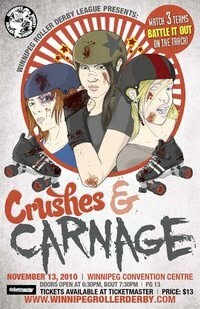 Crushes & Carnage- Roller Derby Is Back!! My first exposure to roller derby was back in the late 70's when professional roller derby was on television and it's theatrics and antics mirrored the entertainment level of professional wrestling. Two teams battled it out on a raised, banked track surrounded by metal guard rails that concentrated more on the violence and wildly colourful characters than the sport itself. This was sports entertainment at it's lowest, staged fights and exaggerated battles, but it should be remembered that these players were in fact skilled athletes that were participating in a sport. Then one day roller derby seemed to fizzle out and disappear while professional wrestling became even more popular, maybe roller derby was too dangerous and there were too many real injuries. Roller derby enjoyed a bit of a revival on the early 90's with made-for TV "games" such as Rollergames and Rollerjam, but that too burned out. 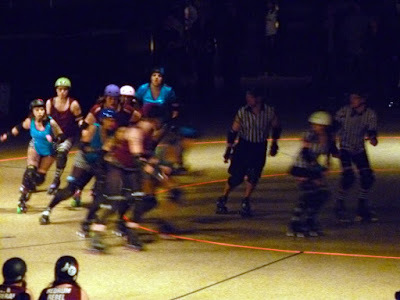 Fast forward to November 13, 2010 when I attended my first live Roller derby match at the Convention Centre, appropriately named; Crushes & Carnage. The game is enjoying another revival, but this time it's different. 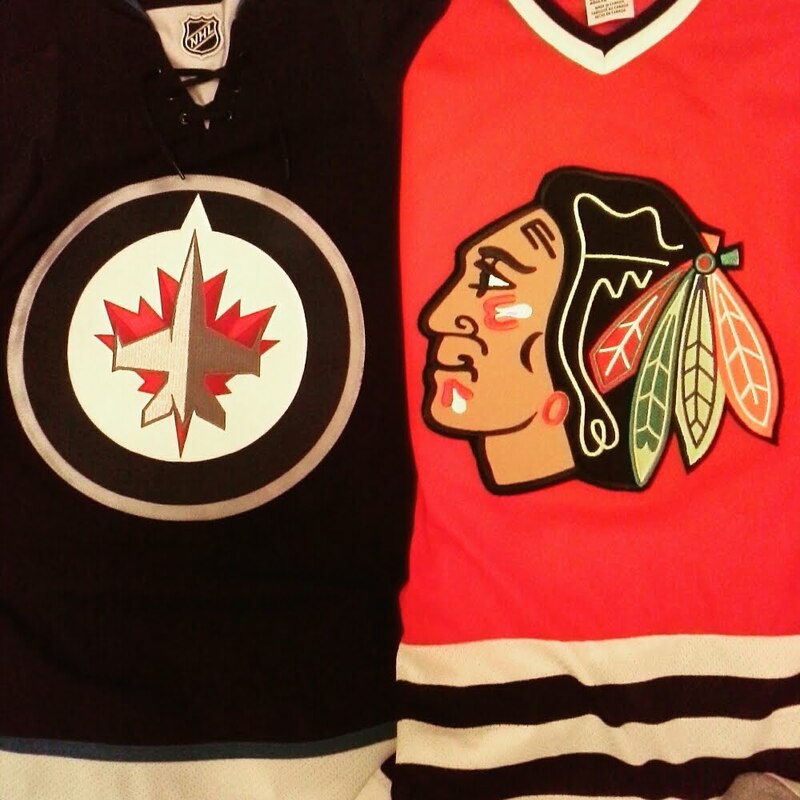 The leagues and teams are more of a grassroots DIY operation focusing more on the the sport and athleticism and the sport is dominated by woman's teams. The Winnipeg Roller Derby League consists of 3 home teams, The Backseat Betties, Valkyrie's Wrath and the Corporation, as well as a travel team, The Murder City Maidens (that represents the WRDL) that competes against out of town teams. Despite the perception of roller derby as a sport with "no rules", actually there are a lot. You can body-check or use your body to block opponents, but much like hockey you can't trip, push, pull, elbow or punch. Depending on the severity of the infraction, a skater can earn a minor or major penalty. The team will skate one player short until the time is served. While the 70's roller derby could have been labeled wrestlers on skates, the game now is punk-rock girls on blades. Lots of cute girls with tattoos, piercings, short skirts and ripped stockings, and the sport still maintains that "cheesy" factor that makes it so great to watch. As you can see from my video, the track is flat, not a banked raised track. I would guess it would be extra dangerous flying over the rail both for the participants and the spectators. As it is, the fans on the floor have to watch out for sliding and falling girls from the track. For an animated video of how the game is played, check out this instructional video on YouTube: The Basics of flat track roller derby. Just for fun, here's clip from a televised 70's roller derby match. A fine example of how crazy that "sport" was. There must be a TV station or a DVD of classic matches from the 70's, oh well, YouTube will have to do. 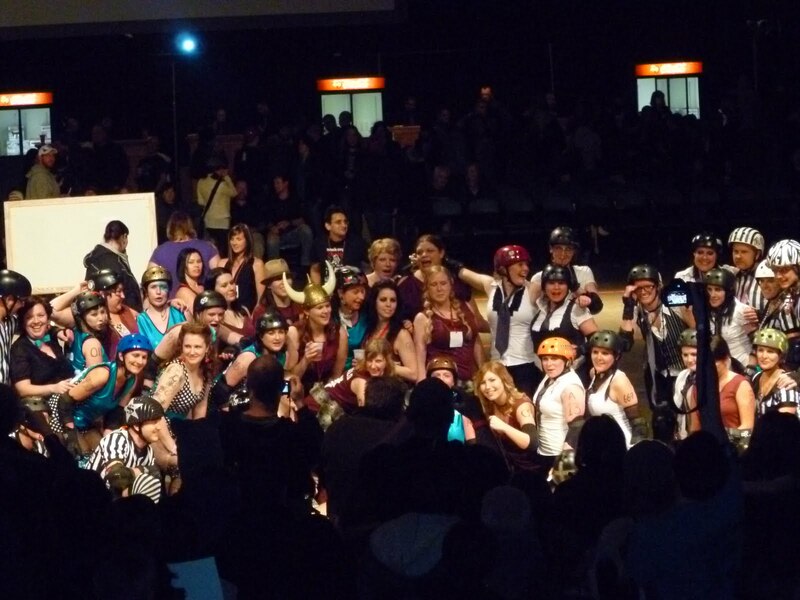 Crushes and Carnage was a lot of fun and I'll definitely have to go to the next roller derby event. Admittedly, I might not have even heard about this if it wasn't for my friend (and my hair stylist! ), Mini Morbid who is on one of the teams, The Backseat Betties. M.M. was awesome and you really see a different side of someone when they are competing on a sports team. Knowing someone involved helps, but it's still an entertaining evening of great sports action and the price is right. It's less than a Moose ticket and at least half the price of a Bomber game...and yes, there's beer! If you are looking for someone to go with you next time, give me a call. If I am free I will go with you. It should be fun.